There are currently 10 FDA-approved treatments in the multiple myeloma space; however, a more personalized therapy could be key to finding a cure, said Nikhil C. Munshi, MD. 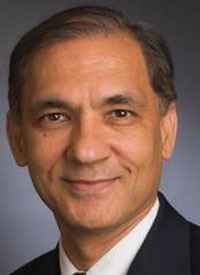 In an interview with OncLive, Munshi, director of Basic and Correlative Science, Jerome Lipper Multiple Myeloma Center, Dana-Farber Cancer Institute, professor of Medicine, Harvard Medical School, discussed the current treatment landscape of myeloma and potential next steps to further advancing care. OncLive: Could CAR T-cell therapy be moved into an earlier setting in multiple myeloma? Munshi: Absolutely. In the induction treatment, our main purpose is to get good and deep responses. That is why we do stem cell transplant—to get a deep response. Transplant is associated with up to 50% complete response. Therefore, it's very obvious to us that we will be bringing these types of treatments into early settings. What are your thoughts on triplet and quadruplet combinations? Triplet regimens are something we have utilized and some of them came from our group here at Dana-Farber Cancer Institute. A number of studies have shown that 3 drugs are better than 2, and that has become the standard of care. The same thing might now apply to these 4-drug regimens. We are clearly seeing deep responses; however, no groundbreaking data have been published yet. It's just a matter of time before we have these data available. Quadruplets have not been incorporated as standard practice yet, but they will soon be for investigational purposes and for regular everyday practice. Is toxicity an issue for a quadruplet combination? The 4-drug regimen is not as much toxic as it is inconvenient. We have seen data showing that 4 drugs are better than 3. In general, we can deal with toxicity. We can also deal with inconvenience if there is evidence that shows a clear benefit in our patients. If a 4-drug regimen is far superior to 3 drugs, and clinical trials prove this, it will become the standard of care and we will take the steps to implement it. What sort of impact, if any, do checkpoint inhibitors have? Unfortunately, in myeloma, checkpoint inhibitors have not gone far. We started with encouraging studies of pembrolizumab (Keytruda) combined with lenalidomide (Revlimid) and dexamethasone; another was the combination with pomalidomide (Pomalyst). These were phase III studies that created great excitement, but were prematurely halted because of toxicity concerns. This has been a setback for us in myeloma. I don't think they are completely gone from our field yet. We could find other ways to utilize them. We could also experiment in cellular therapy. Perhaps we won't use them in the same fashion as we originally thought, but we can make some utility in a different setting. What are your thoughts on the combination with daratumumab (Darzalex) and VMP? This combination is not something we would ever be using in the United States. VMP is not a first-line regimen in this country, and very few, if any, physicians use it. However, it's still a standard of care in Europe, where availability of drugs isn't as clear. It has shown efficacy as a 4-drug regimen and we have seen those data. In the United States, though, we have better combinations that we can utilize. The FDA recently completed a rolling submission for a drug application for selinexor. How could this agent affect outcomes? Selinexor is an interesting target and it's a very useful target from a practical perspective. We have studied it here at Dana-Farber Cancer Institute. It's an interesting mechanism that has shown good efficacy in phase III studies. We are excited that if we have 1 more drug in myeloma it could impact the overall outcomes. Where it will be in regard to all the other great drugs we have, we will have to wait and see. The toxicity profile will be important for this. How has the treatment of patients with myeloma evolved over the last few years? It's been unbelievable. Despite having these 10 different drugs, more drugs are needed. One good example would be venetoclax (Venclexta). This drug is very effective in patients who have t(11;14) myeloma. This drug works well in combination with bortezomib (Velcade) for this patient population, and even outside of it. We are beginning to have drugs that are targeting smaller subgroups of myeloma, instead of just the overall patient group. Venetoclax is also [effective in a] broad, but in an extremely narrow, patient population. Development of more targeted drugs is key. We need one to go after patients who have 17p deletion. With all the genomics and advances that we have, we should be able to do this. There are also mutation-driven drugs that we can develop. Overall, it's been exciting what we have accomplished, but there is room for more.